In Africa etiquette demands that you always first say hello and enquire "how are you" before asking for help or information. Even though the main conversation will usually be carried out in english it is very helpful to learn the basic terms for greetings and farewells in the home tongue. The warm response this elicits makes all the effort worthwhile. Learning the vocabulary as one passes from one area to another gets difficult at times as each country has many dialects. However we always try to learn the basic terms of the main dialect. This is not easy at our age! So I keep a small notebook with the essential phrases in the driver's door pocket. The basic phrases are given at the back of all the excellent travel guides. You will be surprised how starting an encounter with a stern policemen at a road block with a few mispronounced words in their own language will melt hearts and trigger large smiles. 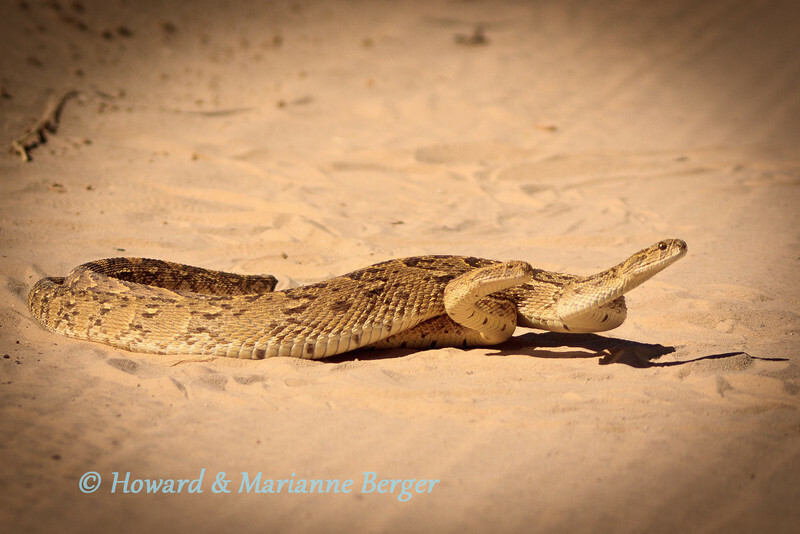 These puff adders (Bitis arietans) were mating in the road near Mata Mata in the Kgalagadi and concentrated on their task. They are very aggressive but sluggish snakes, however Cape cobras and black mambas are not only aggressive but move very fast. We always check around our campsite in the evening and morning, wear shoes, have powerful headlamps, and keep a compression bandage in the cubby hole. In camp We have only encountered one small puff adder in Mata Mata and a Cape cobra slid past my foot in Nossob camp. On both occasions we immediately called the game rangers. However the message here is about snakes on the road. We used to give them a wide birth and pass slowly to move into a good viewing position. NO LONGER!!. A Cape cobra did'nt slide away but attacked the front tire and "disappeared". We went straight back to camp and thorough inspection of engine bay, underbody, wheels by game rangers revealed nothing. We were careful that night around the car and by morning had forgotten about our non-paying passenger. 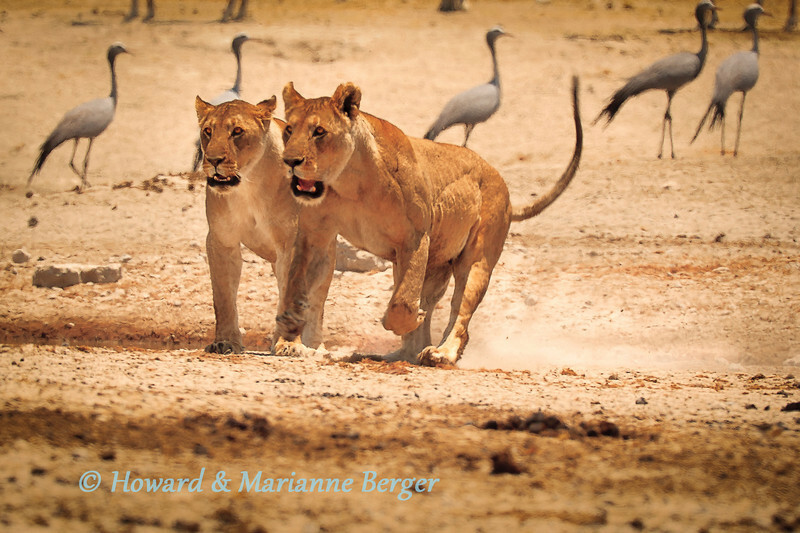 18 hours later while, photographing cheetahs, Marianne noted the 1.5 meter long cobra slide away!!! Don't go near snakes in or out of the car!!!! Also roll up your windows if you don't know your spitting snakes! I have told people off for disturbing the animals, ruining the viewing because animals are scared off, even if you probably can't convince them how dangerous it is, Recently I had a bus driver accuse me of being mad and got his friends to make up another version of his bizarre charge. I will now, on basis of advice on the SAN parks board forums, http://www.sanparks.org/ , rather note number plates and take photos and report to the nearest office anonymously, rather than risk my first fist fight since I got beaten up at school. Roof top tent versus ground tent. 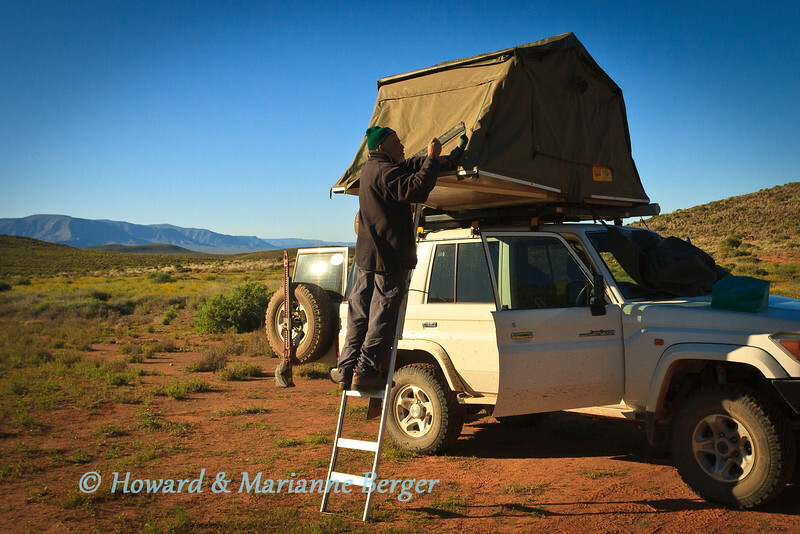 We prefer the roof top tent (RTT). At first we did set up a small bell tent, if staying for a number of days in a fenced camp, to allow us more space in the LC76SW and allow quicker sunrise departures. However after 7 years of 6 months a year practice I get the tent up or down in 5 minutes. In good weather that is! When its freezing, tucking in frozen flaps is painful; and in the rain and dark careful slow steps are advised. But we find it very comfortable, with good mosquito protection, and feel much safer high up in the non-fenced camping areas. The toilet facilities have been discussed above.. Do remember to varnish the wood, re-waterproof the canvas, and have a few spare bolts for the aluminium poles/hinge fittings (the latter was a one off problem years ago). We have had 7 years of fantastic service from this tent, with amazing help from the manufacturers for small adjustments e.g. adding velcro to sideflaps to allow easier opening of ventilation flaps. As we drive off first thing in the morning and I dont feel like removing metal supports from flaps in the dark. No tent is safe. Get back into your car and be protected by the "Faraday cage" phenomenon. See our detailed discussion at http://www.lightningsafety.com and http://www.landcruiserclub.co.za (search under "RTT and lightening". Simple rule that is advocated is:"30-30" rule: take shelter if the time from seeing a flash to the time you hear thunder is 30 seconds or less, and don't resume activities until 30 minutes have elapsed from the last lightning and thunder. Pole Pole, Korna Kali Mbele !! This phrase in Swahili means Slowly, Slowly, Sharp Bends Ahead, and we repeatedly came across it written on the tarmac as we traversed mountain passes in Tanzania. It has become our motto for life in general!! 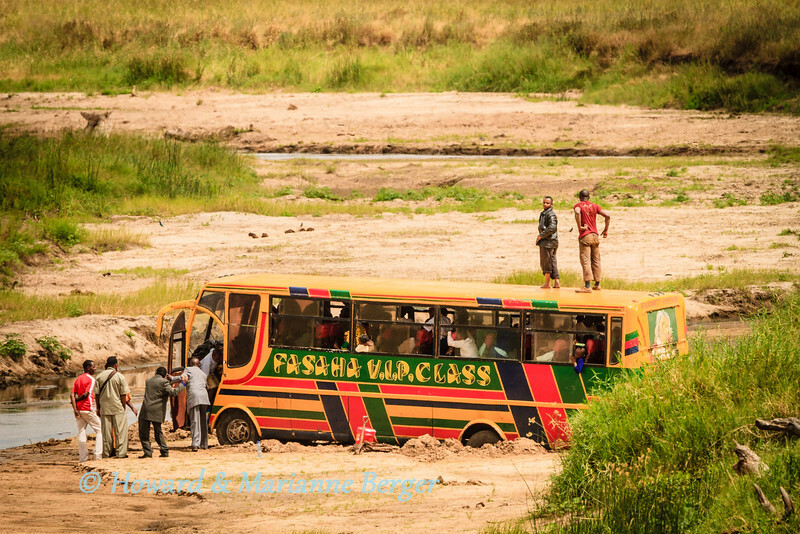 Travelling in Africa is most dangerous when on the roads. Giant potholes wait to ambush you, and I try to spot the brown patches in the grey tar from afar.The local chauffeurs travel vast distances, and are excessively confident, a blend of rally and grand prix drivers moulded into one. Rolled over transport vehicles are encountered everywhere, after they have stopped rolling if you are lucky. So be very careful e.g.drive slowly i.e. old age adventurers have little cash but much time. Always look right and left at crossings, even if your traffic lights are green! Watch out for playing children, doublestory loaded bicycles,on narrow busy roads, and game or runaway cattle dashing out of high grass.We fitted a bullbar for our trip up Africa.This bus, filled with trainee tourist guides, got bogged down trying to cross a river bed in Tarangire National Park, Tanzania. Never drive at night if you van help it!! Use your zoom lens to make him smaller!!! In Etosha I decided to photograph an approaching large bull elephant but make him small against a background of looming clouds. I zoomed out with my 16-35mm lens. I could hear my wife spluttering, as the distant elephant approached. I took my last shot, and put the camera down to find the elephant looming outside my drivers window. He eyed me as he gently pawed the ground. I sat very still and he went on his way! I now know how powerful that zoom effect is. The day before we watched a bull elephant drinking with his back to us. We parked 40 meters further on well away from the elephant's well worn path leading back from Fischer's pan to Klein Okevi waterhole. As we had hoped, he turned and trod his path, but at the road did'nt cross over but turned right to come closer and closer right behind us. We saw the tusks through the rear view mirror and then the rear window!!. Suddenly the car bounced three times as he repeatedly pushed down on our roof rack. We just sat. 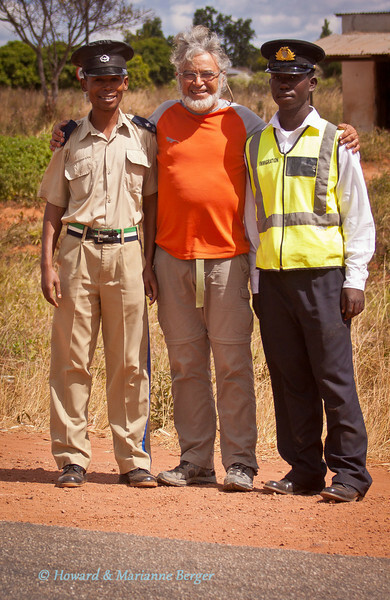 After a few tense moments, he seemingly was satisfied with our shock absorbers and springs, because he then left us and went on to Klein Okevi. Phew. What to do with elephants? It is sometimes very difficult to reverse back e.g. towing a trailer, cars behind you, or very narrow path. You of course can never predict the strange and dangerous behaviour of some fellow tourists. We had a bus charge alarge bull right next to us in Etosha! Be extra cautious with some elephants. Assess if they are in musth (Hindi word for mischievious): secretion from temporal gland between eye and ear associated with dribbled urine staining back legs. Also be careful not to seperate mother and calf. We follow the advice in the excellent animal behaviour book "Beat about the Bush" by Trevor Carnaby (Jacana Press):- We pull over to give the elephant room to pass, turn off engine and airconditioner, close windows, and wait. This has worked for us up till now with bulls passing gently inches from the scared ghostly white Landcruiser. I do keep forgetting what the characteritics are of a mock or real charge!. I suppose there will be no time to check if the latter happens. 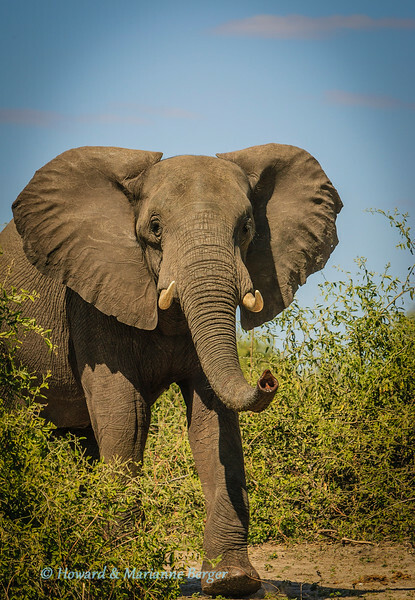 The photograph was taken in Botswana, Chobe National Park, an elephant (Loxodonta africana) checks our landcruiser over before gently moving on. The wonderful sunset at our camping site at Kalizo Lodge, on the the Zambesi river, Caprivi strip. Lots of photographs to edit but danger of malaria must never be forgotten. The following summarizes the measures we take to prevent malaria. These tips are only general guidelines to help you understand the possible choices. We are meticulous about measures to avoid being bitten because we do not take prophylactic tablets such as mefloquin or malarone. We took this decision because we spend 6 months a year in the bush and were worried about the side effects of prolonged ingestion of antimalarial drugs. A. Awareness of risk – find out if your trip will take you to a malaria risk area. a) Insect repellents: See excellent review http://en.wikipedia.org/wiki/Insect_repellent There is no evidence that vitamin B ingestion including B1 (thiamine), garlic, or the ultrasonic devices http://www.thecochranelibrary.com/userfiles/ccoch/file/CD005434.pdf. ), work. See recent BBC summary on failure of electronic repellents:- http://www.bbc.co.uk/news/magazine-20669080. Useful repellants include candles, commonly containing citronella as the active ingredient. Other candles based on other indigenous plant oils have been marketed but reports on their efficacy are mixed or not available. We have stopped using the candles and prefer to use insecticie coils. The candles are bulky to store on our long trips, and after a few hours the flame is repeatedly doused as the wax melts. For local application to the skin Citronella is also effective but it evaporates rapidly and requires frequent reapplication. Oil of lemon eucalyptus has had positive results in some studies and its products are increasingly being marketed. However DEET, a synthetic chemical, is the most effective deterrent for topical application (see below). To limit the amount of chemicals we apply to our skin we also use plant oil based repellant patches. They are stuck onto clothes and when the patch is pressed there is delayed release of repellent (see 1st inset from left). I have no information on their effectiveness but they do give off a powerful odour which may decrease your circle of friends if not the number of mosquitoes! DEET (N,N-Diethyl-meta-toluamide) is a synthetic repellent that is applied to the skin. It has been widely used for many years and is regarded as the gold standard for repelling mosquitoes. Encephalopathy has been reported, but very infrequently. Nevertheless the amount applied must be limited, especially in children and pregnancy as it is absorbed through the skin, see review about extra precautions needed in children http://en.wikipedia.org/wiki/DEET). b) Insecticides: products based on plant pyrethrums are available to kill the mosquitoes. Mosquito coils which must be lit to release the toxic fumes contain the synthetic pyrethroid “allethrin”. They are popular. We found the coils were very fragile and not easy to use, until we started placing them in the special coil holder that is available(3rd inset ). We are concerned about recent information of the potential toxic effects of the particles they release, and will only use them outdoors around our table. c) Wear long-sleeved shirts/long trousers, socks, I do even wear my hat at night to protect a balding head, and drape a head net over it if insects are really bad. Sleep under an intact mosquito net (pre-dipped in permethrin, a synthethic pyrethroid)). Our Eezi Awn rooftop tent has mosquito netting on doors and windows and it is not practical to use a mosquito net inside the small area. Permethrin sprays (4th inset) to treat textiles e.g. tent, nets, sleeping bags, and clothes are also available http://www.hhltechnology.org/vital-protection-anti-mosquito . The treatments must be regularly repeated e.g. every 3 months or after 30 washes. My hat, shirt, and trousers in the picture had been treated. However, since Craghoppers http://www.craghoppers.com/ introduced their Nosilife clothing, which is permanently impregnated with Permethrin, we have been changing over to their clothes (5th inset). Studies done in army troops show that the combination of topical application of DEET and Permethrin impregnated clothing offers the best protection against mosquitoes. d) Don’t forget the biting time is dusk and dawn, as in the morning rush one may forget to cover up. The rules get harder to follow when it is very hot so increase DEET coverage if you decrease your clothing cover. Also rain and sweat will decrease the effective duration of protection with DEET. We are amazed to see the hundreds of mosquitoes ganging up in the showers in the camps and so we try to shower in our afternoon breaks rather than the evenings. We also have a AA battery charged mosquito swotter near at hand (inset on table). But remember the anopheles mosquito is silent so you will often swot the innocent! This weapon is probably more useful to defend against tsetse fly squadron attacks!! with your GP and travel clinic if you need malaria prevention tablets. Take the correct tablets, start on time, follow the exact schedule and always finish the course. see a doctor IMMEDIATELY if you have any symptoms (e.g fever, flu), even for a year after you return. Tell the doctor you have been at risk. Because we are sometimes far from medical help we have a self diagnosis finger prick kit with us (inset at top), as well as a course of therapy using CoartemR for use in an emergency. The diagnostic kit is very reliable, but remember to check the expiry date as it will be used infrequently. But I will always contact expert help as well using our satellite telephone if necessary, as the symptoms are not specific e.g. headache, nausea. Nothing guarantees 100% protection against malaria – it is important to protect yourself and your family as much as possible, but if you have any symptoms, see a doctor Don’t forget we are not experts on this subject and are just providing our own opinions and internet references to help you wade through the mass of information that is available. You must get the expert advice of your GP or travel clinic on what the optimal preventive measures are for you and your family!! Why are nocturnal animals so sensitive to light? Many animals i.e. especially nocturnal animals have eyes with a reflecting layer, the tapetum lucidum, situated at the back of the eye between the pigment and choroid layers. This acts as a mirror reflecting available light back into the eye, giving the photosensitive rods a second chance when light intensities are very low. The layer is made up of white crystals of a compound called guanine. The tapetum lucidum is not present in man and other primates, and the red eye seen in us with flash photography is produced by light reflecting of red blood vessels. The eye-shine from the tapetum lucidum can help identify animals at the dark e.g. distance between the pupils, height above ground, numbers of eyes e.g. herds, movement e.g. hopping. http://en.wikipedia.org/wiki/Tapetum_lucidum). The color of the eye-shine is not always red as the color is influenced by the source light, angle of the light entering the eye, the clarity of the lens, health of the retina, and also the color of the eye pigments. So eye-shine is blue in horses (see photograph), green in cats and dogs, and red in rodents and birds. Nocturnal animals can see in minimal light because of the large number of rod cells and the presence of the tapetum lucidum in their retinas. But this night vision is easily disturbed by bright light. The rods are filled with visual pigment rhodopsin which activated by light, triggering the visual stimulus to the brain. This activation results in decay and the rhodopsin must continually be recycled for reuse (The visual cycle). This process takes time and massive destruction of the rhodopsin by a bright light can blind the animal for up to 30 minutes, disturbing their behavior for this period.See our Blog http://blog.africaraw.com for detailed discussion (part 1&2) of vitamin A metabolism and the visual cycle. Unfortunately not all lamps are sold with clip on red filters, so if you must use your lamp use it for brief periods at low intensity, and do not shine it directly into the animals eyes but down towards their legs. 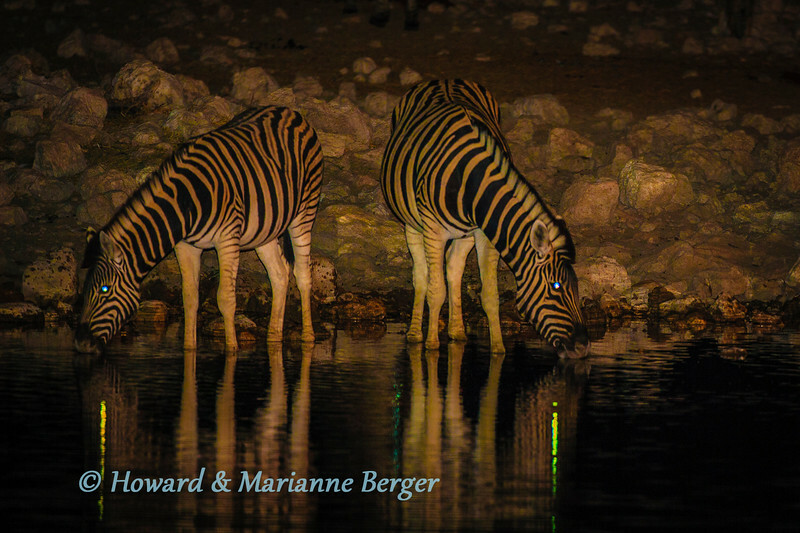 Zebra (Equus quagga burchellii) drinking at night Okaukuejo waterhole, Etosha National Park, Namibia. A honey badger (Mellivora capensis capensis) raids the dustbin once again at Halali camp, Etosha National Park, Namibia. 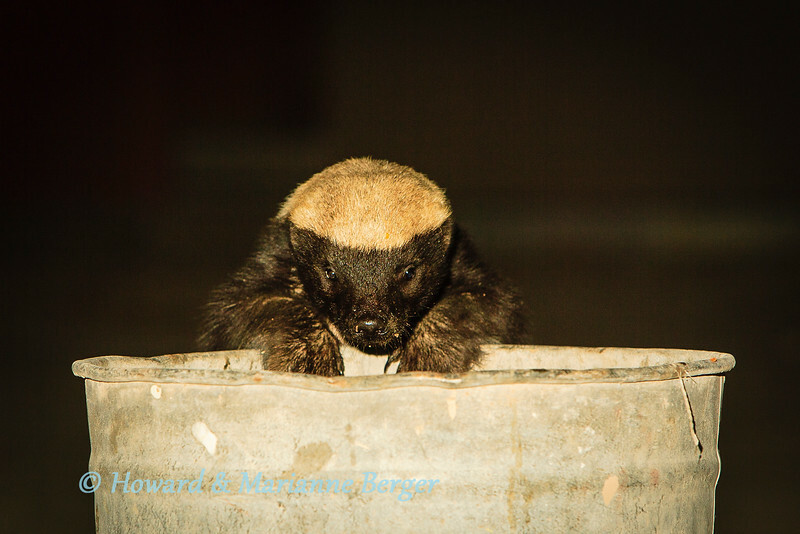 We have only encountered the honey badger in a camp at halai in Etosha. They come right up to the dustbins and will push of the lid and turn over the bin with their powerful bodies. They are renowned for their courage and ferocity but if left alone will not attack humans & appear to only be interested in discarded scraps. Halali camp has now raised the dustbins onto the tree trunks and nightly badger visits were rare when we visited in 2011. The jackal is a major problem. 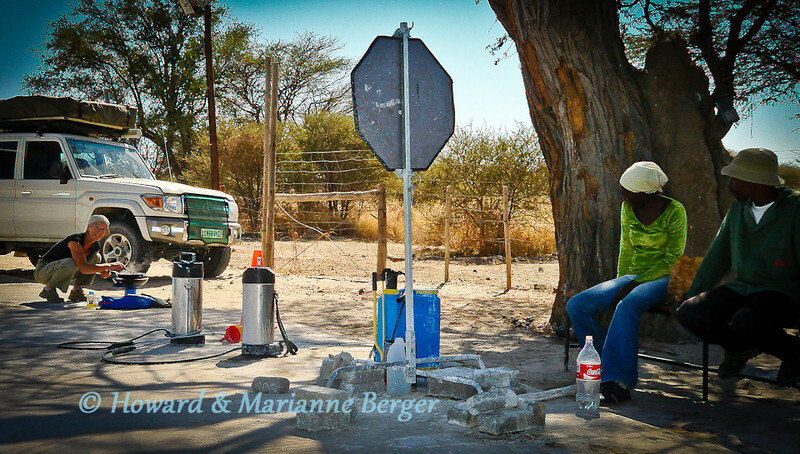 In our experience particularly in Nossob camp in KTFP and Okaukeujo & Namutoni in Etosha. Despite warning posters some tourists feed them and thus they return every night and are real pests. They are also extremely dangerous as they can carry rabies which is often fatal in man. Nossob camp in KTFP has made a determined effort to keep jackals out by keeping gates closed day & night and putting up electric fences. But, wherever you are, dont leave your food unguarded, or in a split second you can loose your meal to these wily creatures. They can also break into your tent if it is not zipped up tight. Probably the biggest pest are the vervet monkeys and baboons. They are not present in the dry reserves i.e. KTFP and Etosha but very common to the KNP, Botswana, Zambia, Zimbabwe, & all the way up Africa. They will even enter the car if the window is open. Baboons are apparently only scared of adult male humans, and will react aggressively with women and children in order to obtain a meal. We have tried the rubber snake trick to scare of monkeys and baboons, and they only reacted with disdain. A catapult is apparently a useful deterrent but I misspent my childhood and now seem to only shoot backwards! Tents will be raided when you are away. They can open zips so use a small padlock or wire tie, but they will even tear the tent to get in if the can smell food. Thus do not store foodstuffs in your tent. Tinned foods may be safe although a recent topic discussion in the Kruger park forum reports baboons opening beer tins ( http://www.sanparks.org/forums/viewtopic.php?style=2&f=67&t=40891). Your best bet is to keep foodstuffs in the car, with open foodstuff in a cooler box or fridge with a latch. I did try the rubber snake deterrent on a jackal and now have two pieces of it as an amusing memory! I was worried he would swallow it and obstruct his intestine after he just grabbed it and ran off. But luckily it tasted terrible apparently and I found the pieces of my "dead' snake the next morning. So many tourists travel through Africa without any problems. Its seems a pity to worry anyone about the dangers of being in the wild. But everynow & then a news item reminds one its best to be cautious out there and try not to become the first recorded case of any attack anywhere.!! 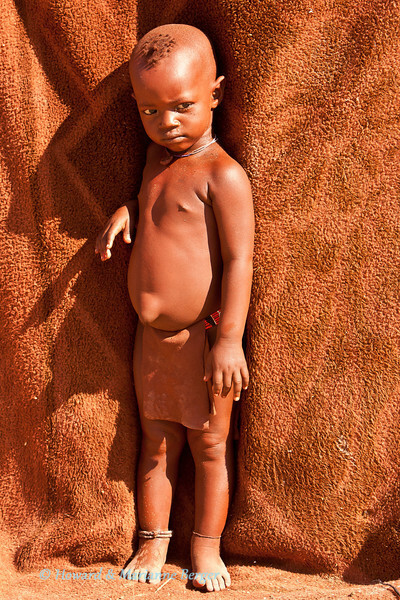 A few years ago a hyena killed a child camped with family at Xakanaxa in Moremi game reserve. 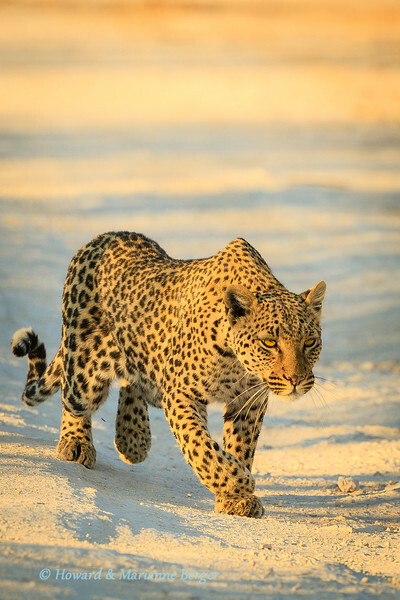 Now at the North gate camp a leopard attacked a child http://www.landcruiserclub.co.za/cms/index.php?name=Forums&file=viewtopic&t=53790) The child survived with with relatively minor injuries. The forum readers warn about especially the potential danger to children in the wild and shows pictures to illustrate the interest that lions & cheetah display when they see children!! So always be careful day & night when camping in unfenced camps. A topic being discussed on the Kruger Parks Board forum at the moment is the question on when to close the car window when photographing animals http://www.sanparks.org/forums/viewtopic.php?style=2&f=67&t=63789. I find it hard to close the window with the heavy camera equipment fixed to the door & window. But I do rehearse the routine for turning on the ignition key & mobilising button, the pressing window buttons as the lions walk close (I would prefer an old fashioned mechanical window handle!). If he gets real close and gives one of those piercing stares I will raise the window. I also always turn the rear mirror inwards in case he could alarmed by seeing the reflection of a "rival", No one seems to have reported an attack through an open window but with my luck I could find the lion with a toothache or a headache. Of course the biggest danger is with baboons & monkeys & open windows. Also see my cobra under the bonnet warning in the other note in this trip tips section. Recently a python has been reported going into the engine bay! . Finally, even in fenced camps remember snakes & scorpions can always visit, I really think kids should always wear their shoes, unless they have grown up in the bush. Scan your campsite area every now & then with a bright light at night & early morning. In unfenced areas check the bush around you before getting out of your tent. Maybe I worry to much but a few seconds of precaution may prevent hours of searching for medical help & worse. Enjoy this great continent & the excitement & beauty it offers. Go safely! Near Ngobib waterhole, the leopard (Panthera pardus) glows in the early light as he crouches deep, and passes our car, while stalking impala, the hunt was unsuccesful. Etosha National Park, Namibia. This is a an infrequent but serious condition during or soon after long journeys. We urgently urge all people undertaking long flights & long car trips to game parks followed by prolonged periods of sitting in cramped positions waiting for decisive photographic moments to read the excellent reviews with their references on internet, for example http://www.nathnac.org/pro/factsheets/trav_dvt.htm, & follow this up with a visit to your GP if you are at extra risk. 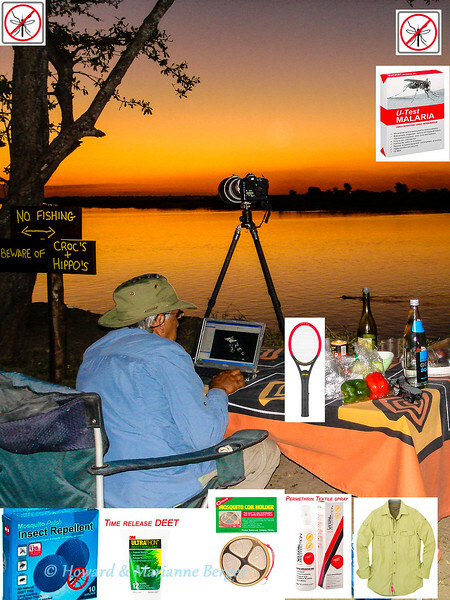 Our short piece is meant to draw your attention to the risk of DVT on long photographic safaris, to point you towards expert opinions, & discuss the simple steps we take to try & prevent DVT. Deep vein thrombosis (DVT) is the formation of a blood clot (thrombus) in the deep veins of the limbs, usually lower leg although it can occur in the arms. The development of DVT involves three related factors 1) slow blood flow, 2) increased tendency of the blood to clot, & 3) damage to the vessel wall. Factor 1) is the one that we will concentrate most on as this is the most relevant for healthy travelers sitting for long periods while driving or photographing during their trips in Africa. DVT after long flights first attracted attention, & was dubbed ‘economy class syndrome referring to the cramped seating for passengers on cheaper flights. However, further studies reported DVT following lengthy car and train journeys. The preferred term is thus Travel Related DVT. 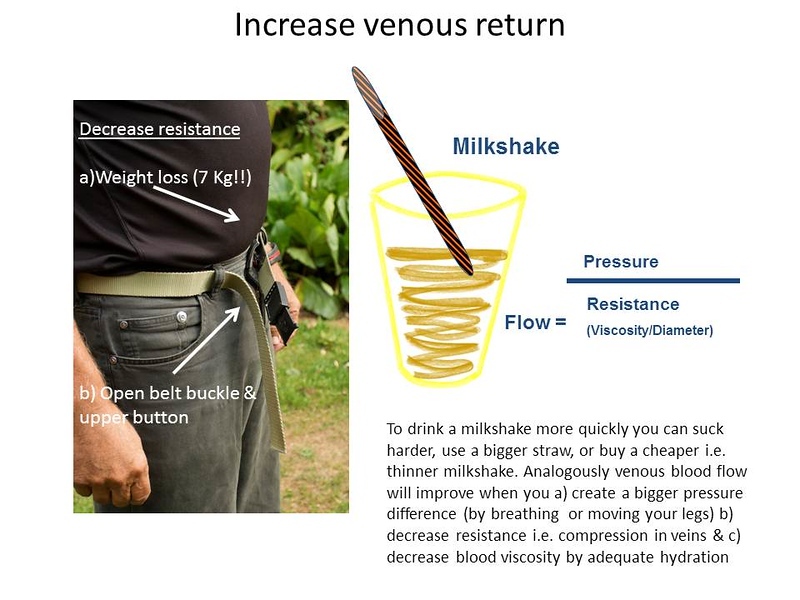 In our blog the factors influencing blood flow are explained simply using the analogy of drinking a milkshake http://blog.africaraw.com/?p=173. c) increased viscosity (thickness) of the blood because of dehydration ( fluid intake insufficient or output (urine) increased by alcoholic drinks. Travel related DVT can occur in otherwise healthy persons but an increased tendency for the blood to clot may be triggered by prolonged travel. Flights longer than 8 hours may induce a hypercoagulable state in some travelers, especially if they are on taking oral contraceptive pills or have genetic predisposition to venous thrombosis (. Schreijer A, et al. Lancet 2006;367:832). Other risk factors are a previous DVT or pulmonary embolism, pregnancy and puerperium, malignancy, cardiac failure or infarction, recent surgery, oestrogen therapy, & rare diseases with a tendency to clot, i.e. thrombocythemia or antithrombin deficiency. There may no symptoms. However, pain in the calf accompanied by swelling, redness, increase warmth, & swelling of the leg due to fluid accumulation are important indicators. The most severe complication of DVT is pulmonary embolism i.e. thrombus breaks off & lodges in the lungs, causing breathing difficulties. This has been estimated to occur in approximately 1 to 2 cases per million flights longer than 5,000 km (Lapostolle F et al. N Engl J Med 2001;345:779). Simple measures (see Figure) reduce the risk of travel related DVT. Compression stockings, if correctly fitted by forcing more flow to through large veins reduce the risk of DVT (Hopewell S et al. Cochrane Database Syst Rev 2006;CD004002). But I imagine this measure, useful during a flight, will not be easy to adopt when travelling in the car in hot African countries.